Heard some foreigners queued for over 2 hours at this queue. 2 hours? I guess that's par the course for most other airports. I remembered waiting that long at Washington Dulles to clear immigration & customs. Oh yes IAD is crazy with the long long lines at the immigration and I avoid flying into IAD and prefer JFK instead. Speaking of KULs' long lines, I think they either have an unexpected increase in arrivals OR the counters opened are not sufficient. MAHB should look into this. On another note, does anyone notice that the font and colours used for the new signages are not on par with the standard fonts they use at KLIA1? Just an observation. Long lines at IAD are using during the bank of afternoon arrivals from Europe. The mornings tend to be relatively quiet. It might be standard at crappy airports but that does not make it acceptable IMHO. Not when KLIA (and the country as a whole) has greater aspirations. Speaking of which I saw four automatic gates installed for foreign passport holders at KLIA. I saw one foreign traveller attempting to use it but didn't work for her. Apart from that, there is no one using that machines as all of them queuing up just like in your photo. My cousins queued at Heathrow for 106 minutes. Immigration queue at big airports usually take 45minutes to 3hours depending on how efficient they handle peak arrivals. At BKI though at night there's a horde of Korean and prc flights at night and sometimes only 4 foreign passport counters are open that one is unacceptable. At KLIA I was stuck at the domestic to international immigration counter for 45minute as only 2 were open you could hear how anxious many of the pax were as they could miss their connecting. Countless times ground crew have unloaded passenger transfer bags. By the time passengers reached the designated gates their have already been offloaded. This is one of the reasons why I would never buy flights with less than 1.5hours of transit time in between no matter how attractive the fares are. Edited by jahur, 04 January 2019 - 02:41 PM. 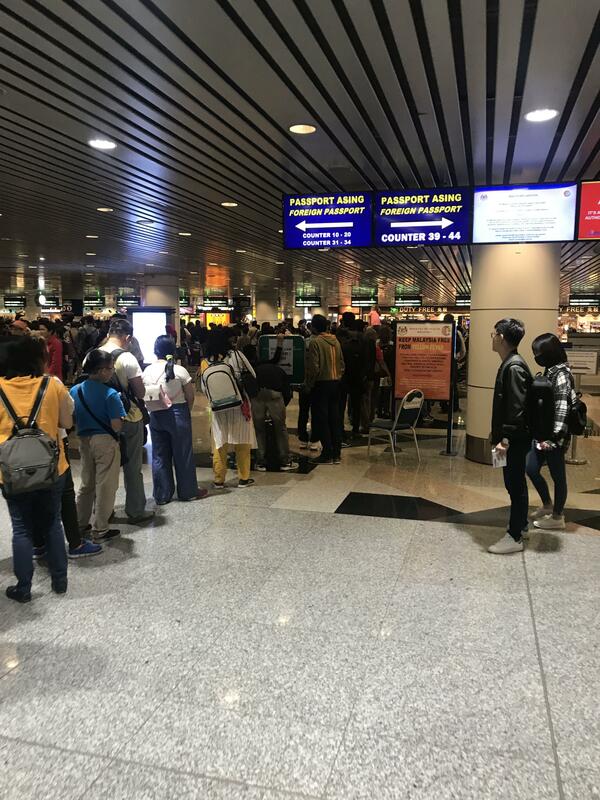 At KLIA I was stuck at the domestic to international immigration counter for 45minute as only 2 were open you could hear how anxious many of the pax were as they could miss their connecting. When the dom-intl immigration is busy, I find it faster to head airside and go upstairs to international departures. Especially for Malaysian passport holders as the main departure immigration hall has autogates. "Now we have bees in KLIA2. We got maggots, rats and now bees. Maybe a zoo or KLIA 2 honey?" the AirAsia Group Bhd's chief executive officer tweeted on Monday (Jan 7) night. "Could be new income which could reduce airport tax. Jokes aside, this is dangerous for my passengers and my staff. Will the non-communicative new CEO solve this? Geez, you know how many would die for a trip just to experience it? Bird droppings at BKI or Trafalqar Sq/Leicester Sq ? KLIA dropped to no 54 World Best Airports by Skytrax from no 44 last year. And yet they say they have exceeded the service quality targets? Just complacent and not innovative like our neighbor down south.